Today’s briefing is… brief, with just one item on the agenda, but check back over the next couple of days for a special edition of Brekkie Bites. After Larry Cain won an incredible fifth-straight Chattajack title on Saturday, my mind has been racing trying to remember every incredible winning streak in the sport. It also got me thinking about reviving an old feature that never actually saw the light of day: a “world records” section that would house all the extraordinary achievements in our sport. So look for the “record winning streaks” in either Wednesday or Thursday’s edition of Brekkie Bites, and if you think an extended “SUP Racer World Records” page would be interesting, let me know on Facebook. The insane destruction derby race known as Red Bull Heavy Water has officially been called off for 2018 due to a lack of swell, leaving many top paddlers either disappointed or quietly relieved, depending on whom you ask. Now in its third year, the extreme race was planned for San Francisco’s notorious Ocean Beach, a heaving beachbreak that can hold waves up to 20ft. But the surf never reached the Red Bull gnar gnar levels required (10-15ft minimum), so we’ll have to put the popcorn away for at least another 12 months. 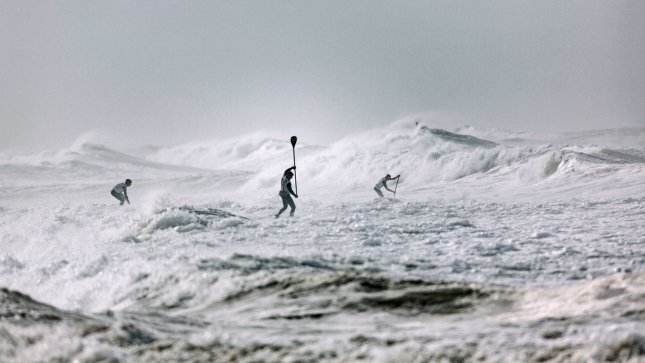 Red Bull has set the standard for crazy surf racing. It’s basically “the BOP on steroids” as paddlers brave an extreme course that combines a long distance leg (from San Fran Bay back to Ocean Beach) and a traditional in-and-out-of-the-waves section that requires a combination of skill, strategy, patience and perhaps a pair of brass balls. Last year was famous for the fact that many top athletes failed to finish — some even refused to start after they saw the conditions on race day. Connor Baxter, Zane Schweitzer and many others have been camped out in San Fran post-PPGs in preparation for an event that many of last year’s participants called the most difficult race they’d ever done. After infamously failing to invite women to compete in 2016 and 2017, several top-ranked female athletes got the call up this year. We’ll have to wait another year to see how they fare (and to see who gets the lion’s share of the record $75,000 prize purse).